In a prior blog post, we introduced the capability of ordering metal roof and wall panels, trim and building components online using the American Building Components online ordering website. While most people are familiar with ordering products online from a list of standard offerings, there is another exciting aspect to these sites–you can use them to order custom trim and structural products too! That means you don’t need to call or meet a sales rep during business hours to place a custom order. Custom trim and structural products can be ordered online anytime it is convenient! Here’s how it works. Most companies with online ordering websites offer products in standard shapes and lengths. 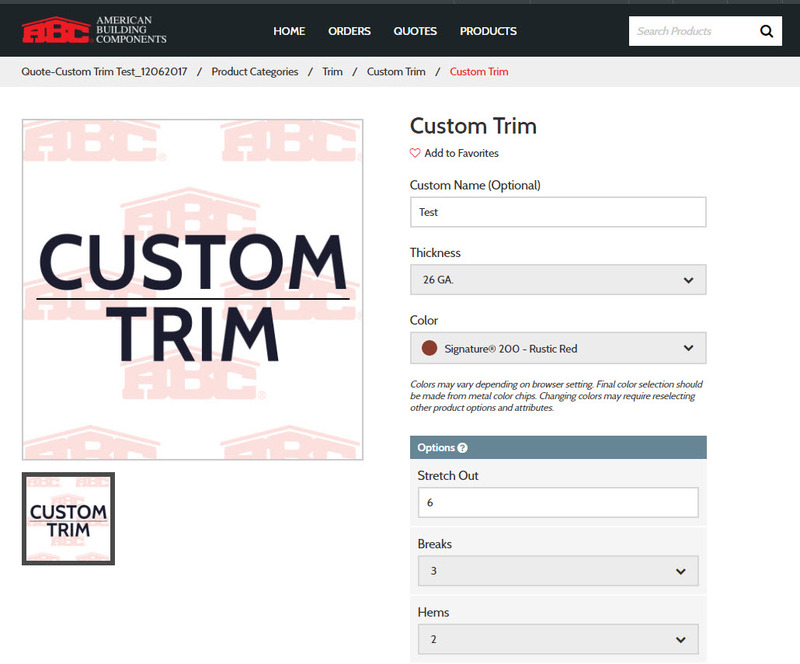 Recognizing that not every job is standard, the ABC online ordering website offers customers the ability to order custom trim and structural products online 24/7. Using the “Custom Trim” or “Custom Structural” product categories, you can select the trim or structural product you want. Once selected, you can customize the product by indicating all desired specifications using the provided menu options. These include steel thickness, color, stretch-out (material width before it’s bent), breaks needed in the trim, hems and other features. Even with the ability to set custom specifications, sometimes visuals can help ensure products are manufactured correctly. To help, ABC takes product customization a step further than most. You can use the ABC online ordering tool to add your own custom hand-drawn or drafted drawings. These help show the complete layout of the product as a supplement to the specifications you select online. You can easily upload and link already-prepared drawings to your ABC order in any common electronic file format. If drawings aren’t done, ABC’s online ordering website provides an easy-to-use template that walks you through how to create simple hand-drawn or digital drawings. Once all of the customization information is input, simply check for accuracy and add the item(s) to your cart. Then, simple repeat for as many custom trim and structural products required. Additionally, you can save each custom item created with it’s own product name to quickly add them to future orders. Online ordering tools that offer a quick and seamless way to include custom trim and structural products can save you time and help your business run more efficiently. The ability to customize products online makes it significantly easier to do business with the material supplier, particularly since most other online tools only offer standard products.